AFTER the international break let's get back to winning ways with a bang! I'm starting another £10 – £1,000 Challenge on Saturday and you can have free shot at it! 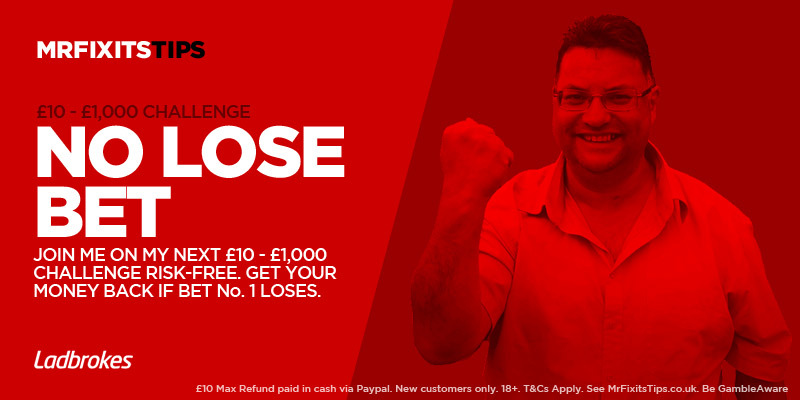 My friends at Ladbrokes have challenged me to beat them, by turning £10 into £1,000 and they're giving you the chance the get involved risk-free too! All you need to do is open a NEW account with Ladbrokes and place the first bet of the challenge on their site. If the first bet loses I'll refund your £10 back in cash to your Paypal account. 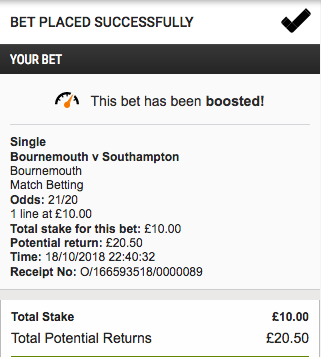 The first bet is £10 on Bournemouth to beat Southampon, which is available at 1/1 (at time of publishing), which I go boosted to 21/20. So what's the catch? Well there isn't one. All you need to do is follow the instructions below to place your risk-free bet on Bet no.1. This offer ends at 3:00pm on Saturday 20th October 2018. This offer is only available to those opening a NEW Ladbrokes account via a link on this page / site, or via a link provided on my twitter page. To be eligible, users must open your Ladbrokes account and place a £10 on Bournemouth to beat Southampton. Failure to register via one of the links highlighted on this page will result in no free bet being awarded, should the bet lose. This offer is open to UK and Ireland residents only. Refund will be credited to your Paypal account within 72 hours. 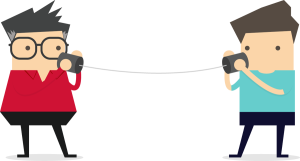 Only one claim per computer, per person, per household and per IP address. Offer is limited to residents of UK and Ireland. This offer is limited to the first 50 claimants and MrFixitsTips reserve the right to withdraw this promotion at any time and to not reward any user we feel contravenes the Terms and Conditions. MrFixitsTips will not be responsible for any losses incurred as a result of this promotion. MrFixitsTips decision will be final on any claim.